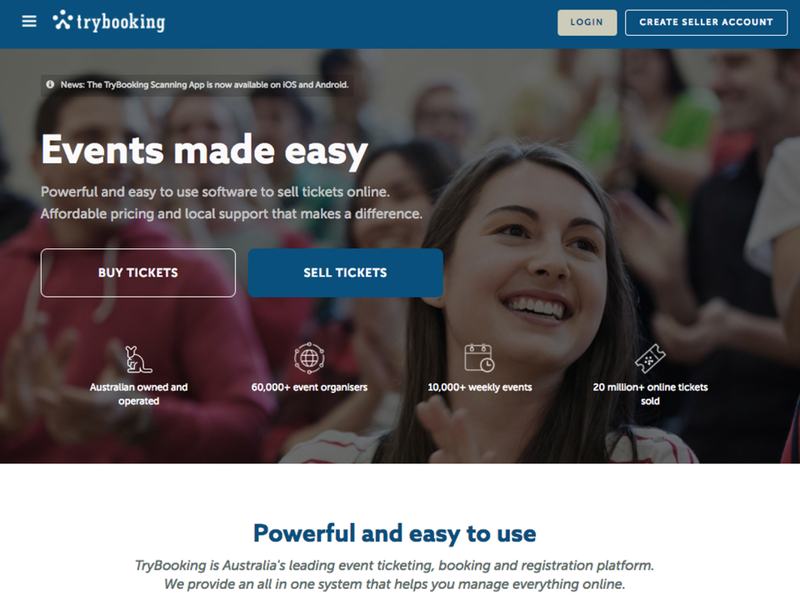 TryBooking is a powerful event ticketing, bookings and registrations platform. One of the most affordable solutions in the industry (100% free for free events), it is packed with features including customisable events, unlimited ticket types, interactive seating plans, real-time sales/marketing reports, the TryBooking Scanning App, embeddable widgets and more. As the largest Australian ticketing provider, we provide you with unlimited local support and account management at no extra cost. Pros: The price is the lowest we've seen in the market. The product has great capabilities to deliver more than we need too. Knowing our money is here in Australia is also a plus. Our bookers don't need to login to purchase or access their tickets, big plus. Cons: There are a few too many clicks on the booking process, but really this is minor and I believe this is being addressed soon with the recent update and newsletter. So not a big one here. Overall: We've used Trybooking for over 5 years now for our business and tried another recently but it was expensive and not well supported so we are back. Why did we try it you may ask? We'd seen others using this newer product but no one mentioned their heavy fees or lack of service and that they were an overseas company. It had on the glitz but didn't delivery on what we needed. So we are back with Trybooking and won't be trying another system again, it does all we need including interactive seating plans, registrations and simple fundraising events. When you run things on a tight budget, the low fees of Trybooking are a bonus and I think they've been that price since we started, which is nice. Our treasurer has commented that they prefer a local product and have never had to wait for our payments too. So for those that need an easy cost effective system, you can't go past Trybooking. Great product, great price and well supported. Cons: I wish I had used it many years back but didn't know about it. Overall: I've used now 2 big American systems here at our theatre. One was used a lot in the theatre space and we used it for over 6 years but it was hard to train on and clunky to use. We then moved to another where we were promised so much and it failed to deliver. We only lasted months with it. So next move was local to TryBooking and amazing. It delivers so much for the price. My customers are sending us emails, they are enjoying how easy it is to use and that there is not high fees on the outside. We advertise a price and that's what they pay. Recommendations to other buyers: Stay local. Great service too. Overall: We were lured to try the big American product but the product did not live up to the sales promises let alone being 3 times the price. For the past 5 years we've had such a great experience with TryBooking and one momentary blimp using another product but we are back with our 200 events reach year again. Can't go by TryBooking for product service and price. I have appreciated trybooking team's professionalism and willingness to help with all inquires. Pros: I found trybooking to be user friendly when building each event. The Trybooking team were outstanding and prompt with reply's for help and advice. Once registrations opened our participants found it easy to register and scanning of the tickets worked well. I am able to clone each event to edit for 2019 which will saves many hours of my time. I look forward working with trybooking again and give thanks for the amazing friendly team behind the scenes. I would recommend this software to other organisations without hesitation. Thank you so much to the skilled people involved building this software. Cons: Nothing to dislike, as suggestions for extra data to be added for our future events are meet with positive answers. Overall: The benefits were immense saving so much time for 2019 with cloning events to edit. Using this software has saved so much time for us in the future. Don't Try, just buy Try Booking; it is the best!! Cons: I just wish that it had been more aligned to our industry. Overall: Although the software is not purpose built for the travel industry, we have been very impressed with the ability to mold it to suit our purpose. It has so many great features such as a wide variety of reports, linking, gift certificates, ability to handle both credit card and cash transactions and much more. All this and absolutely amazing support it represents great value to anyone contemplating using it. I could not recommend it more highly. Recommendations to other buyers: Integration with Xero will be great and ACT! CRM would also help us greatly as we use both of these products. Pros: Trybooking has come a long way, it is a very straight forward system and you can embed your events into websites etc with ease. Great for Australian Event hosts and anyone who needs to sell tickets online. Cons: Not much to say here. If there are issues when you use the system, Customer support get it sorted for you promptly. Pros: It is easy to use yet you still get the results you want. I started off never having used online ticketing before yet I still got the hang of it straight away. Overall: I have used TryBooking for 3 seperate events already and will continue to use them. Their system is very easy to understand once you get the hang of it and their fees are very low, in fact they are the lowest I've seen so far. I have spoken to one of their customer support ladies, Tanya, on multiple occasions and she is always friendly, helpful (and patient!!) with me. All in all I would be recommending them to anyone who is after quality customer service and a low price. Recommendations to other buyers: I think it is perfect for first-timers or those with little experience in setting up events online, because if you ever get stuck the customer support staff are of incredible help. Excellent, Simple, Effective, User Friendly, Professional and Prompt Support Services. Pros: The whole software was easy to follow and navigate through for a first time user. Loved the reports and that I could check on a daily basis the status of the sales using the App. Cons: I needed to learn more about it's functional use and features e.g. data allocation etc. I wasn't sure how to add a background image to the online ticket. Thank you for your review Maatakiri. We are happy to hear you are enjoying using the software. In terms of upskilling on data collection and our other features, you're welcome to check out our online learning centre or contact our Support team for further assistance. Easy, does everything I need, looks great, and super helpful customer support staff. Pros: It allows for online booking system without monthly payments, looks great, feedback is that it's easy for customers to use, and super easy to navigate most of it behind the scenes. What I couldn't do or didn't understand customer support was able to help quickly, efficiently and very professionally with lots of options and assistance behind the scenes. The product is great, but I'll use trybooking again because the customer support was so helpful. Cons: Nothing yet. It would be nice to have the booking / processing fees a little cheaper but they are still comparable with other online booking systems. Comments: The software has brilliant time-saving features, especially when it comes to reporting. The system also allows you to create customised seating plans where you are able to move your customers around even once they have booked! The customer service at TryBooking is outstanding and nothing was ever too much trouble. I would definitely recommend this software to any artist or company wishing to sell their event's tickets! Pros: Simple to use with easy to follow instructions. Cons: Learning some of the more complex features will take me some time. Overall: I have a medium size space with seating and I needed to find a ticketing product that accommodates seating plans and is user-friendly for my team. Everyone picked it up in just a few minutes and we have created a months worth of events in a very short time. The system is easy and now that we have templates it will just get faster. I'm very impressed at this stage. Recommendations to other buyers: Test it out and get help if you need it. They have a good support team. Comments: I have been using Trybooking for 3 years, for online payments for an annual charity ball which has around 800 attendees per year. I love that I receive an alert as soon as payment has been made and I can put a transfer fund request straight away. It usually takes 2-3 business days for the transfer to be completed, and the charity I work with finds this so useful. Pros: The price and simplicity. Overall: Brilliant and never an hiccup. I've now processed over 10 shows with Trybooking and it's just saved me so much time and effort. It's simple to use and delivers all I need for a fraction of what I used to use. Thank you Trybooking. Pros: The support was fantastic and reporting on funds back to the committee detailed and all we needed. Overall: Had to setup a series of fundraising events. Was able to on this one system setup a concert with seating plans, conference with multiple purchase options and a simple movie night. Set these all up on Trybooking. Easy to do. Recommendations to other buyers: Great price point too and is loaded with features. Pros: Amazing service, quick setup and very reasonable prices. Overall: TryBooking's customer service is incredible, I'd recommend this to anyone who's looking into event ticketing. They really went above and beyond to help me (even though I had endless questions) with a friendly attitude and helpful advice. Congrats guys, you're fantastic!